Did you miss the beginning of the 12 days ? Welcome to the Tenth day of Christmas holy moly we are almost done already! , earlier in the series I shared a gift box I used to gift some home made soaps. Well here is another one and this time I’m going to share with you a soap recipe! For this soap I used Shea Butter base which you can get from Michael’s it’s about $10 for 2lbs, so use a coupon, I picked up some of the cheap molds to make my soaps. I then added Gel (food grade) icing color in the color Kelly Green from Wilton. Well they came out a beautiful shade of green but not really a Christmas color or even a mint color oh well. I then added Mint extract and 3 tablespoons of crushed mint again from my pantry. I did not use fresh, apparently using fresh herbs and spices in your soaps can do weird stuff to it, so using dried is better? I don’t know I was just trying to make some cute homemade gifts. For this packaging I used a design from the silhouette store for the box (Design ID #70569) I used the dimensions of my soap to gauge the size my box needed to be. 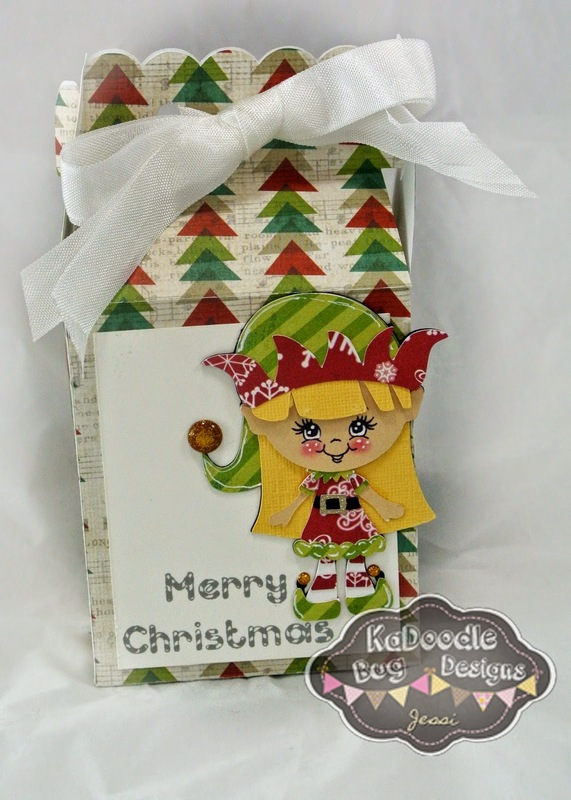 I then used Holly the Elf from Kadoodle Bug Designs, for the decoration on the box. My go to ribbon is seam binding, the best place to get it is on amazon. Head on over to the Kadoodle Bug Designs fan page and like and comment on this photo for a chance to win a pattern of your choice. The prizes include twine bundles, a stamp set, ink pads, paper pads, 5 cricut lite cartridges they have been packaged up inside brown paper bags with numbers (1-12) stapled to the top. I have no idea what is in each bag. If you are the winner for that particular day the number you comment will be which bag you win. I hope that makes sense. Thanks for stopping by, I hope you come back tomorrow for another chance at winning and more projects. Love the elf and the soap seems wonderful. My number today - 8. Love this and your elf is adorable! !